GENERAL SANTOS CITY – Sarangani Rep. Manny Pacquiao has proposed the formulation and adoption of a protocol in providing immediate and efficient legal assistance to Overseas Filipino Workers (OFWs) apprehended abroad. The proposal was contained in a letter dated July 20 sent by Pacquiao to AGAP party-list Rep. Nicanor M. Briones, chair of the House Committee on Overseas Workers Affairs. The letter, a copy of which was obtained by Philboxing.com, was received by Briones’ office on July 27. 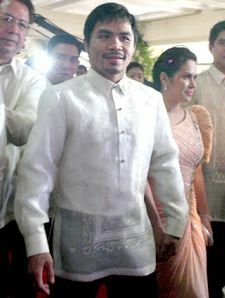 Citing “in aid of legislation,” Pacquiao, vice-chair of the Committee on Overseas Workers Affairs, requested Briones to immediately schedule a committee hearing inviting concerned officials from the Overseas Workers Welfare Administration, Department of Labor and Employment and Department of Foreign Affairs, particularly the Undersecretary for Migrant Workers’ Affairs. In the same letter, Pacquiao asked the Committee to direct invited labor and foreign affairs officials to present an inventory of all pending cases as of June 30, 2015 involving Filipino migrant workers, especially those detained, whether still undergoing trial or already serving prison terms. Pacquiao further requested the Committee to require concerned government officials to submit demographic data on all Filipino Overseas Workers as of June 30,2015. Pacquiao’s meeting last July 10 with death convict Mary Jane Veloso in Wirogunan Prison Facility in Yogyakarta, Indonesia, obviously prompted the Sarangani lawmaker to take the initiative. During their meeting, Pacquiao learned that from the time of Veloso’s apprehension on April 25,2010 in Audisucepto International Airport in Yogyakarta until the time she was sentenced to die on October 11,2010, the Pinay migrant worker was only represented by a court-appointed pro-bono counsel. “It was only on 21 October 2010 when our Philippine Embassy in Jakarta hired a private counsel to assist her in her appeal,” Pacquiao said in his letter. Pacquiao believed that had Veloso been provided with a private lawyer during her trial, there was a big possibility that the outcome of her case would have been different and in her favor or, at the very least, a lighter penalty would have been meted out. “I am informed that Ms. Veloso’s story is not isolated and has evolved to be a very disturbing pattern,” Pacquiao said. Meanwhile, Pacquiao is set to met with representatives of the Filipino Community in Tokyo, Japan during his there on August 5-8. Pacquiao will join with the Philippine delegation which will attend in a scheduled FIBA meeting on August 7 in Tokyo. “I’m joining with the Philippine delegation to support our bid to host FIBA 2019. But before the FIBA meeting, I’ll be meeting with the representatives of the Filipino community there to know what are their concerns,” Pacquiao said. According to him, the Philippine ambassador in Japan had pledged to arrange his meeting with the representatives of the Filipino community there. Pacquiao will be accompanied in his Japan trip by his wife, Sarangani vice governor Jinkee, and some members of Team Pacquiao.